Imagine a day spent in a peaceful hazel coppice, listening to the songs of melodious warblers flitting frantically amongst the trees; being brought home made cakes and cups of tea and enjoying the company of a small group of like-minded individuals, as you are driven half crazy by the frustration of trying to make a beautiful, even, round basket from just a few bits of willow. Well it doesn’t have to be frustrating and in fact Ed Burnett, our excellent teacher, will make the process as calming and enjoyable as possible. We throw in a warm welcome, the beautiful green, leafy surroundings, a kettle boiling over an open fire and of course Jane’s cakes; Ed brings calm and many years of craft experience and teaching. 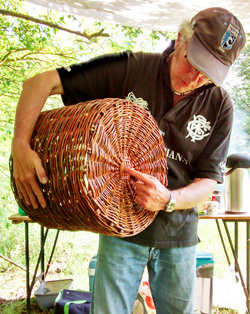 By the end of what will be a fairly intensive day despite the relaxing surroundings, you will depart with a basket you’ve made yourself, that will be perfectly capable of holding some things and moving them around your home or garden. 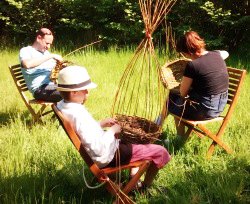 This course is designed for the complete novice but Ed can be flexible enough to provide some more advanced tuition for anyone who has done a bit of basketmaking before.